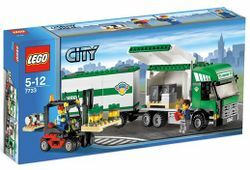 7733 Truck & Forklift is a City set released in 2008. It contains a truck with a trailer containing some boxes, a forklift that moves up and down that can hold a pallet, three pallets and two minifigures. One of the pallets holds a fuel tank which features the Octan colour scheme; it does not however, bear the Octan logo. The 60020 Cargo Truck is quite similar to this set. This set was included in the Product Collections set K7734 Cargo Transport Collection. Facts about "7733 Truck & Forklift"